The perfect look – dress or casual – requires a perfect shirt. 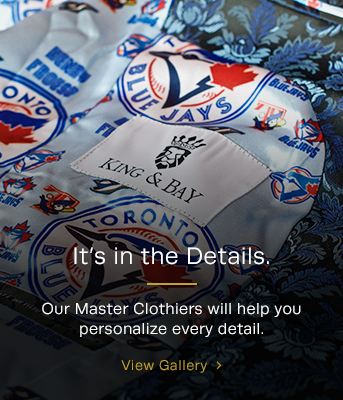 At King & Bay, perfection is delivered in the fit and detailing of all our custom shirts. Is there a better investment than a custom shirt? Well, maybe. But, if you ask our clients, a custom shirt from King & Bay in Toronto can change a whole lot. Men's wardrobes revolve around their shirts. The shirt is the item that pulls your look together, jacket on or jacket off. So it makes a lot of sense to invest a bit in a custom shirt that fits perfectly and feels extraordinary. A custom shirt can solve a lot of problems. Many men experience difficulty buying shirts for reasons of proportion. It could be the arm length. It could be the neck. It could be the chest. Whatever the specific reason, trying to find a ready-to-wear shirt that is actually 'ready to wear' for your body can be exasperating. A King & Bay shirt is the best shirt you'll ever own. At an early stage in his career, Ashish clearly saw the value of investing in custom to help his burgeoning career as a professional engineer. And it's paid off. In his custom suits and shirts, Ashish definitely presents a level of confidence that other young professionals envy. We start with 100% Italian Cotton. Every King & Bay custom shirt is made from 100% Italian cotton. And, just to be clear, these are is not just good quality cottons. These are extraordinary quality cottons. With thousands of fabrics available in solids, checks, stripes, paisley, print, modern designs, you can express yourself any way you like... or even better... in many ways. It's quality you can see and feel. Want a custom shirt that feels as good as it looks? We can help. Every detail is considered – the collar, cuffs, the placket, trimming, thread colour, button colour. You get the picture. Suffice to say, you'll look sharp. It's a look you won't get anywhere else. The King & Bay guys genuinely care about letting you explore your creativity and ensuring you feel good in what you're wearing. If you're still buying off the rack, you have no idea what you're missing out on.